Keith Barrett, 59, lives in Ottawa, Ontario with his wife Robin. For over 20 years, Keith has co-owned a business supporting adults and children with developmental and physical disabilities. He continues to work full-time. Keith was diagnosed with Alzheimer’s disease in December 2016. The news was that I had young onset dementia (YOD)—specifically, Alzheimer’s—was difficult news to hear and I couldn’t believe it. I was retested in the spring of 2018 as I did not present as having young onset, but the retesting confirmed the initial diagnosis… YOD, probable Alzheimer’s. I was in disbelief with the information! Dementia? Really? Alzheimer’s? There was no family history of the disease and I was still working full time and driving. I told myself the testing must be wrong. Over the course of three years, my wife and I encountered a variety of interactions and reactions with healthcare professionals. They were always professional, but they did not listen! Our comments were either not acknowledged, or they were normalized—I was “getting older,” you know, or it was stress. In two cases the physicians didn’t believe the diagnosis, as I didn’t (and still don’t) present as having such a diagnosis. Finally, one neurologist paid attention to the issues and challenges and a referral to a neuropsychologist was made in 2016. We decided to go private to avoid further lengthy delays in the healthcare system! In December 2016 and April 2018, I was seen and tested by two different neuropsychologists at two different clinics. The outcome was the same: YOD—probable Alzheimer’s. Both of my neuropsychologists were extremely professional and caring… they too shared that they wouldn’t have believed I had YOD, but the testing results said otherwise. While both physicians delivered my diagnosis in a caring and compassionate manner, at the first results appointment all I heard was, “get your affairs in order.” This included appointing a Power of Attorney, ensuring wills were in place, having my work supervised, seeking counseling, etc. This further added to my disbelief and stress and I left with a sense of hopelessness and a feeling that my life would never be the same! At the appointment to get the second test results, I really thought and expected the outcome to be different. While the neuropsychologist delivered the message in a caring and compassionate manner, he, too, gave me advice on getting my affairs in order. Hearing that message AGAIN was painful, frustrating—I wanted to scream. Being told this now twice, to get my affairs in order, really!!!!!!! F***… so now I’m accepting it, I guess. Initially we held off sharing my initial diagnosis in 2016 because it was too close to Christmas and I still didn’t believe I had YOD. I anticipated my friends and family to react like me… and they did… they were in disbelief and shocked. Others simply did not know what to say. Awkward moments, so redirection was the key for me. Sharing my diagnosis was extremely emotional for my family as this was new for us. We were fortunate to not have had any direct experience because dementia did not exist in our family. We were so unaware of this new world topic. When I first broke the news to my family, not a lot of questions were asked, if any, as no one really knew anything about dementia, including myself. My symptoms were not as visible to them. I’m fortunate to have an amazing supportive family! can see her face the day we were informed and I wondered (and still do), how she really felt and managed that day. She shared my tears, but we survived the moment. I had my own stigma around dementia, that it was “an old person issue.” I assumed it was only people in late stages of life… someone in their 80’s in a nursing home, a secure unit, medicated, who needed assistance in doing almost everything with limited recall or recognition. I felt certain that someone with the disease could not drive or hold a job or carry a conversation. Dementia has no boundaries—it can impact any person, culture or any age at any time and it will impact your entire family and friends. People CAN live well with dementia if there’s a spirit of understanding in all people around them and a collaborative approach in supporting the person living with dementia, while focusing on what they CAN do and not what they CAN’T do. Dementia is a progressive disease. The symptoms or decline will not be predictable and could vary each day. The person living with dementia will create and present their own unique journey, they will create and travel through their own course at their own speed, so don’t try and predict or focus on when they will change or decline. Instead, value the moment, as tomorrow may not arrive as you think. Some people don’t believe that I’m living with dementia as I can still carry on with life’s basic conversations. I’m able to talk about the weather, exchange pleasantries, do things that I’ve been doing for many years. It’s called cognitive reserves. So, if you meet someone with dementia, don’t challenge their diagnosis—that’s the last thing we need to hear as we’ve already done that… instead embrace who we are in the moment. Dementia is difficult to diagnose and it takes a lot of time to do so. There’s no blood test to confirm a diagnosis. People around you will likely notice the changes before you do. The changes start out small, but eventually become a source of anxiety for you and the people around you. A person living with dementia must have their human rights respected—be respected as a person, be able to make decisions, participate in the community and not be discriminated against. In other words, they are to be treated the same way as they were before their diagnosis. We need to put the person first and NOT the disease. 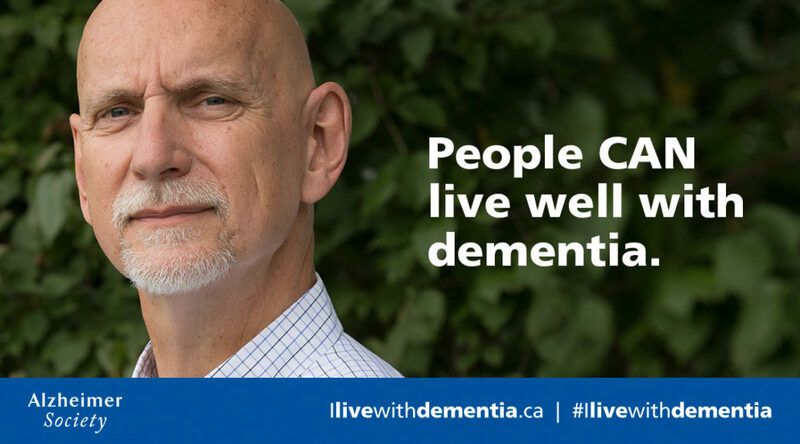 Visit ilivewithdementia.ca to read more stories by people like Keith and learn more about Alzheimer’s Awareness Month.